Today, Apr 11, 2017, maintenance work is scheduled to be done on the mailing lists server, including the shifting from lists.sip-router.org to lists.kamailio.org as primary domain.It is expected to not have any relevant downtime, but one never knows. Maybe the archive won’t be available for short time due to changes needs to be done to the web server after mailing lists server is upgraded. We expect to fill again the capacity of the conference room, if you haven’t registered yet and plan to attend, do it as soon as possible to secure your seat!Many thanks to our sponsors that made possible this event: FhG Fokus, Asipto, Flowroute, Telnyx, Sipwise, Sipgate, Obihai, Simwood, Evariste Systems, NG Voice, Digium, VoiceTel, Core Network Dynamics, Pascom.Thank you for flying Kamailio and looking forward to meeting many of you at Kamailio World 2017! We hope to meet many of you at the 5th edition of Kamailio World Conference, the project’s annual event, scheduled for May 8-10, 2017, in Berlin, Germany!Thanks for flying Kamailio! Two days and a half of sessions related to real time communications, covering Kamailio and other open source projects such as Asterisk or FreeSwitch and common use cases such as telephony services, WebRTC, IMS/VoLTE, next generation emergency services or OTT platforms. The first day afternoon is hosting the workshops, the sessions where to expect more hands on examples. The second and the third days continue with conference presentations and interactive panels. Like in the past edition, several companies will exhibit and show demos during the conference days,Many renowned people of the industry as well as community members are confirmed to participate, definitely an edition one must not miss! Don’t delay your registration, the capacity of the room is limited and we expect to be fully booked again! Register now!Looking forward to meeting many of you in Berlin!And thank you for flying Kamailio! 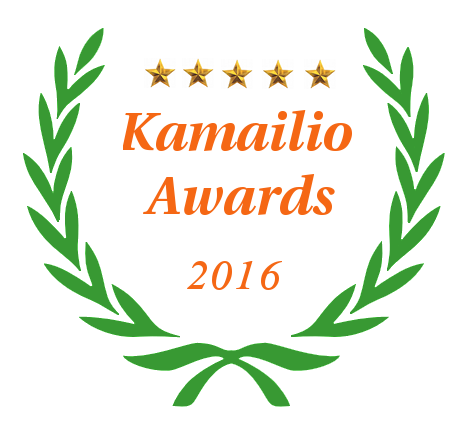 As a side remark, this edition was a bit postponed as I was considering to do a different kind of awards as last year Kamailio project celebrated 15 years of development and this is the 10th edition of the awards, but finally went for the classic module, leaving the special edition for another occasion in the near future. 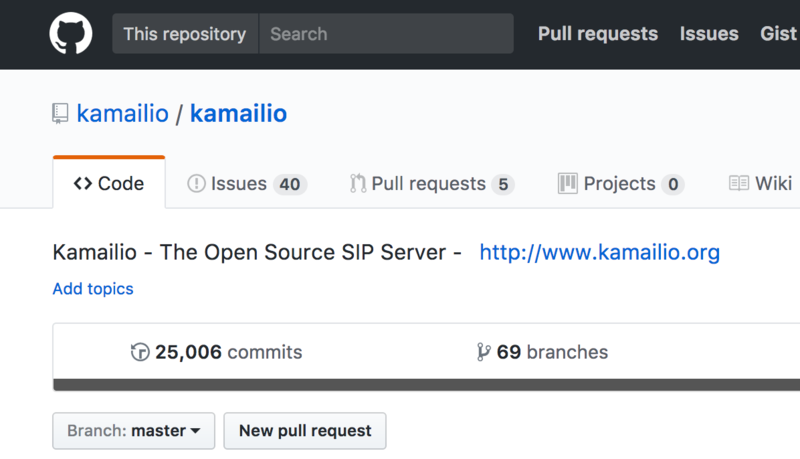 While checking the last pull requests on Kamailio’s Github repository, I noticed that the number of commits to master branch has just surpassed 25 000 (not counting at all commits to stable releases or personal branches). They are counted from the very first day back in September 2001, the migration to Git few years ago converted the commits from old CVS and SVN times.While number of commits is not necessarily a metric of the quality of code, it does reveal a constant and consistent development effort performed during the past 15 years and a half, averaging over 1500 commits per year (n.r., last years with way more commits than the early one due to increase of the number of contributors).The growth of Kamailio development isn’t slowing down at all. 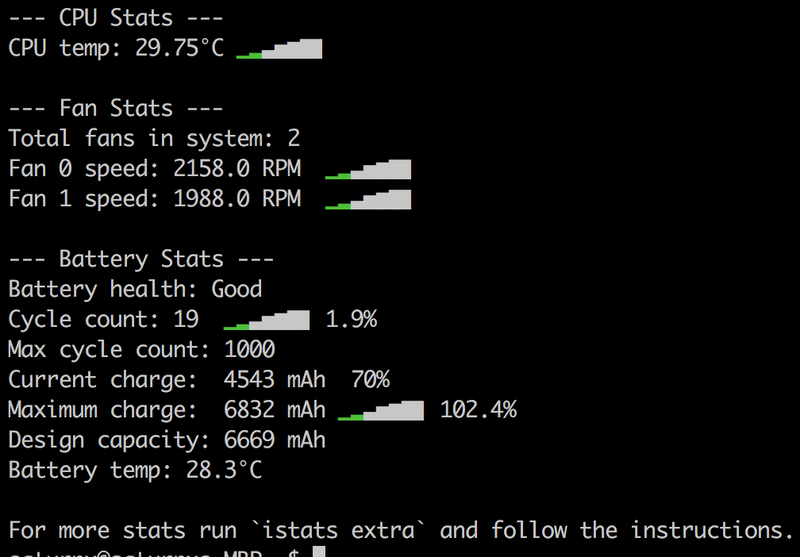 The last major release, Kamailio v5.0.0, was out about one month ago and since then we have 3 new modules already part of the master (topos_redis, ims_diameter_server and call_obj modules) and one is pending to be merged being now a pull request (keepalive module).Many thanks to all developers and users that contributed to enhance the set of features, quality and stability of Kamailio over all these years!Should you want to meet face to face with many Kamailio developers, be sure you reserve in time a seat at Kamailio World Conference, Berlin, May 8-10, 2017! Soon the first version of the schedule should become available, keep an eye on the event website!Thanks for flying Kamailio! git checkout -b 5.0 origin/5.0Hopefully before the end of the month the full release of 5.0.0 will be out.From now on, any corresponding fix has to be pushed first to master branch and then cherry-picked to branch 5.0. No new features can get in branch 5.0. Enhancements to documentation or helping tools are still allowed.Thanks for flying Kamailio! Whenever you write an article about using Kamailio or you become aware of a similar article, do not hesitate to notify us, we gladly publish a news about it.Looking forward to meeting many of you at Kamailio World Conference, May 8-10, 2017, in Berlin, Germany!Thanks for flying Kamailio! We welcome any resource, blog post or tools that make it easier to deploy and work with Kamailio and gladly publish news about them. Should you have or know such resource, do not hesitate to contact Kamailio project!Thanks for flying Kamailio! An of course, don’t forget the Kamailio World Conference 2017, May 8-10, Berlin, Germany.If you are in the area of an event, but you don’t participate directly to it, just ask around in our forums, there might be group gatherings outside of them, such as dinners, meetups, … where anyone can join or simply people being there want to meet you. For discussions about these events, you can use our public mailing lists.If you organize or you are aware of events involving Kamailio, do not hesitate to contact us, we will gladly publish news about them.Looking forward to meeting many of you around the globe during 2017!Thanks for flying Kamailio! Stay tuned for more news about what’s new in upcoming Kamailio v5.0.0!Thanks for flying Kamailio!